The Chamblee Lady Bulldogs continued their strong play this season with a 5-0 win on Friday over Union Grove on the road to steam into the Class 5A girls’ state semifinals. 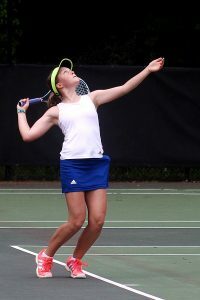 Junior Olena Bilukha continued her personal streak in three years at Chamblee with a 6-1, 6-0 win at No. 1 singles for her 50th consecutive victory and 17th this season. Sophomore Grace Pietkiewicz improved to 14-1 on the season and 25-4 over the past two with a 6-2, 6-0 win at No. 2 singles while senior Leeza Ershtein upped her mark to 22-0 on the season and 34-3the past two years with a 6-1, 6-2 victory at No. 3 singles. Sophomore Madeline Meer and freshman Madison Trinh chalked up win number 8 against no losses with a 7-5, 6-1 victory at No. 1 doubles. Senior Kendalle Smith and sophomore Emilya Ershtein continued their strong play with a hard fought 7-5, 7-5 victory at No. 2 doubles to improve to 7-1 on the season as a team. The state semifinal match pits Chamblee (23-0) against another undefeated team as the 21-0 Kell Lady Longhorns visit Chamblee on Tuesday (May 2) at 4:00 pm. Kell has not lost a point in the playoffs and is coming off a 3-0 win over South Effingham in the quarterfinals. The winner faces off with Starr’s Mill which defeated Carrollton 3-1 on Saturday to advance. The state finals are Saturday, May 6 at the Clayton County International Park with the time to be announced.